Each MDFR Engine includes a station number decal sheet to allow for full customization. Station number locations include cab roof and front bumper, body doors and rear placard. Over a year of development has been invested in the MDFR Rosenbauer scale models. Countless hours of design, proofing, and improvements make this replica museum grade. Production of this Miami-Dade engine is limited to 200 units. Fire Replicas are designed with the elite collector in mind, and manufactured in limited quantities to enhance future value. The MDFR Rosenbauer Commander Engine measures 8.25"L x 2.5"W x 2.75"T and is securely displayed inside a custom case. The case dimensions are 12"L x 6"W x 5.25"T and the platform includes an etched stainless steel nameplate with the MDFR seal, department and truck name. Water-Slide Decal Sheet included so station numbers can be customized on the bumper corners, cab roof, body sides and rear. 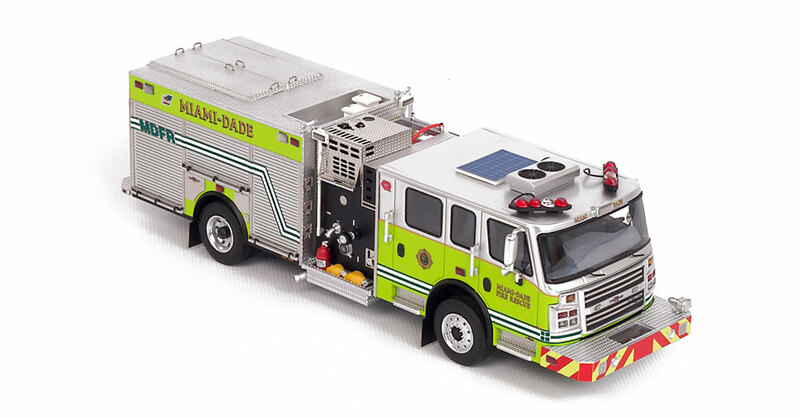 This Miami-Dade Fire Rescue Rosenbauer Engine scale model is a museum grade replica. Like all Fire Replicas models, every detail is modeled to perfection and with razor sharp precision. The replica features the specific department configuration and graphics, leaving no detail overlooked. The display case is custom manufactured with high quality acrylic and resin. The stainless steel etched plate features the department and truck name, and department seal. This replica is a treasure to be displayed and admired and is in no way a toy. Stunning model. Amazing detail. My favorite so far. A truly beautiful model and recommended for those who quality please. This is my first of many trucks from firereplicas! Another wonderful product from Fire replicas with a surprise for your own decal set to personalize your model with the number of your choice. The decals were easy to place and improved the satisfaction with the model. It is displayed prominently in my office. The color scheme is new to my collection and enhances the model overall. I love the Silver over Lime paint job! The paint is brilliant and flawless. Another winner for Fire Replicas. The details like the hose and a fire extinguisher (yes, equipment) in the side squirrel tail trough is awesome. Love the solar panel and wire detail on the roof. The photo etch detail is off the chart: Area over the fire pump (dunnage), Rear ground ladders compartment, SCBA compartments with logo and the cab steps. It appears we have 4 chrome strips on the grille. We do! A very nice touch. I liked the Miami-Dade Rosenbauer so much I purchased the Miami-Dade Rosenbauer, Engine 3 "Big Red". They look great together. I like the Lime better. Its what you get in Miami-Dade. Many thanks to Toy Trucker writer Larry Phillips for making me aware of Fire Replicas. The models that I have received are nothing short of fantastic. It seems that they get better each time I order another model. The price is very reasonable for the quality of the models. All I can say is keep them coming these models are the best "fire replicas" I have seen since Franklin Mint years ago. The personal thank I have gotten is a great touch enclosed in the models I have received. Thank you Fire Replicas for doing such a great job for fire collectors!!! Premier modèle de la gamme avec cette cabine Custom apparu chez Rosenbauer en 2012, et 2eme modèle de Miami après la reprise en début de collection du modèle promis en son temps par THW. Magnifique reproduction, au delà de la patte de Fire Replicas on perçoit le regard inquisiteur des Autrichiens de Rosenbauer sur le respect de l'ensemble des détails : il ne manque aucun logo ! même au dos des marche-pieds escamotables le R rouge est gravé. "First model of the range with this cabin in Rosenbauer Custom appeared in 2012, and 2nd model of Miami after the collection of early recovery model promised in his time by THW. Magnificent reproduction, beyond the Paw Fire Replicas we perceive the inquisitive eyes of Rosenbauer Austrians on respect for all the details: no missing logo! even the back of the retractable running boards red R is engraved. 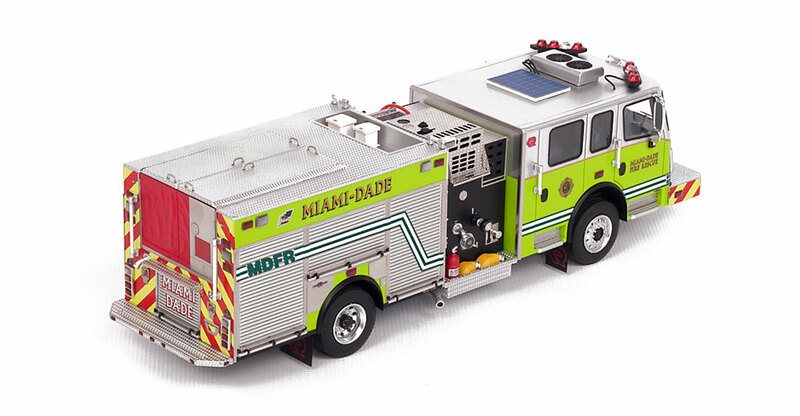 A sheet of decals to customize the template according to the station of his choice is provided; Only missing a laying plane, but Internet is our friend"
Miami-Dade Rosenbauer an accurate hit of a model! I just received my Miami-Dade Rosenbauer Engines today. All I can say is wow! The Rosenbauer Commander cab is modeled to perfection. Especially impressive is the front end detail with a beautifully rendered windshield and spectacular grill/headlight combination. The top of the cab is incredible; accurately created lighting package that even includes wiring! The paint color and finish is perfect and is even better than the website photos show. Overall fit and finish is superb and I like that you can just add number decals to model the unit of your choice. Plenty of decals are included. Finishing things off is the excellent display case Fire Replicas includes with every model. These models are a bargain - they are nothing less than a professionally assembled and finished model with incredible quality and detail.